152:0.1 The story of the cure of Amos, the Kheresa lunatic, had already reached Bethsaida and Capernaum, so that a great crowd was waiting for Jesus when his boat landed that Tuesday forenoon. Among this throng were the new observers from the Jerusalem Sanhedrin who had come down to Capernaum to find cause for the Master's apprehension and conviction. As Jesus spoke with those who had assembled to greet him, Jairus, one of the rulers of the synagogue, made his way through the crowd and, falling down at his feet, took him by the hand and besought that he would hasten away with him, saying: "Master, my little daughter, an only child, lies in my home at the point of death. I pray that you will come and heal her." When Jesus heard the request of this father, he said: I will go with you." 152:0.3 When Jesus heard this, he took the woman by the hand and, lifting her up, said: "Daughter, your faith has made you whole; go in peace." It was her faith and not her touch that made her whole. And this case is a good illustration of many apparently miraculous cures which attended upon Jesus' earth career, but which he in no sense consciously willed. The passing of time demonstrated that this woman was really cured of her malady. Her faith was of the sort that laid direct hold upon the creative power resident in the Master's person. With the faith she had, it was only necessary to approach the Master's person. It was not at all necessary to touch his garment; that was merely the superstitious part of her belief. 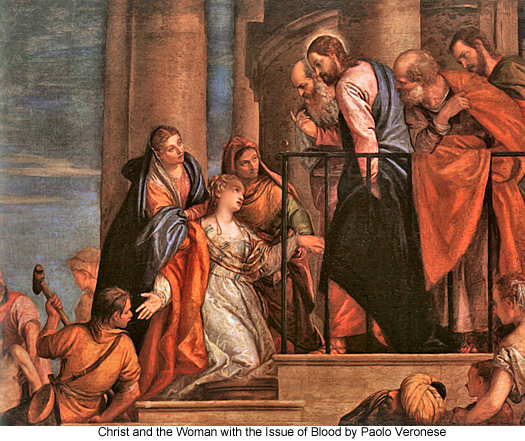 Jesus called this woman, Veronica of Caesarea into his presence to correct two errors which might have lingered in her mind, or which might have persisted in the minds of those who witnessed this healing: He did not want Veronica to go away thinking that her fear in attempting to steal her cure had been honored, or that her superstition in associating the touch of his garment with her healing had been effective. He desired all to know that it was her pure and living faith that had wrought the cure. Mark 5:22-34 Then came one of the rulers of the synagogue, Ja'irus by name; and seeing him, he fell at his feet, and besought him, saying, "My little daughter is at the point of death. Come and lay your hands on her, so that she may be made well, and live." And he went with him. And a great crowd followed him and thronged about him. 25 And there was a woman who had had a flow of blood for twelve years, and who had suffered much under many physicians, and had spent all that she had, and was no better but rather grew worse. She had heard the reports about Jesus, and came up behind him in the crowd and touched his garment. For she said, "If I touch even his garments, I shall be made well." And immediately the hemorrhage ceased; and she felt in her body that she was healed of her disease. And Jesus, perceiving in himself that power had gone forth from him, immediately turned about in the crowd, and said, "Who touched my garments?" And his disciples said to him, "You see the crowd pressing around you, and yet you say, 'Who touched me?'" And he looked around to see who had done it. But the woman, knowing what had been done to her, came in fear and trembling and fell down before him, and told him the whole truth. And he said to her, "Daughter, your faith has made you well; go in peace, and be healed of your disease."